This fragrant cooking technique is a familiar match with salmon, but it's also great for other meats, vegetables, even fruit. Native American tribes in the Pacific Northwest have been cooking on cedar planks for thousands of years. It was a practical way to secure fish and other food to a surface so it didn’t fall into the fire, as well as adding flavor. Cedar-planked grilled salmon remains a classic regional dish, but this fragrant summer taste sensation is also an easy way to spice up so much more. Shrimp, scallops and any seafood you’d put on the barbie are naturals paired with the smoky-savory flavor cedar infuses into the meat as it cooks. Chicken and pork are also great planking candidates as mild white meats easily absorb the flavor of the wood. Another benefit of planking is that it infuses steam, so food stays moist as well as tasty. Barbecuing with cedar planks is not only a delicious summer treat, it’s also a healthy way to cook vegetables without using a lot of oil. Try asparagus or summer squash mixed with mushroom, onions and peppers. For a healthy, delectable dessert try peaches, pears or apples hollowed out and filled with dried fruit and a touch of bourbon or a sweet liqueur. Cooking with cedar planks isn’t just for barbecuing; it works great in the oven, too! Simply place the plank on a baking sheet, and then arrange the meat, vegetables or fruit on top. You’ll achieve the same smoky flavor and juicy tenderness, without the smoke that sometimes comes with outdoor grilling over higher heat. For salmon, preheat the oven to 350 degrees. Place the fillet skin-side down on the plank and bake 15 to 20 minutes, until the meat can be flaked with a fork. “Many people don’t realize they can save money buying a high-quality untreated cedar board at a lumberyard rather than buying culinary grilling planks from a specialty cooking store,” says Stacy Kovats, marketing director at Issaquah Cedar and Lumber. The wood can be smooth or textured, but make sure there are very few knots where grease and oil may settle. Cedar planks for the grill need to be 1/2-inch or more thick — the thicker the better if you want to reuse them. Barbecuing on cedar planks adds a unique flavor, and it’s also a beautiful way to present food. It’s easy to do if you follow some simple guidelines. Soak the plank for one to 12 hours before using it to grill food. This keeps the wood from burning and also helps to keep the food moist while it’s cooking. Make sure to weigh down the plank with a heavy bowl as it soaks, so it’s completely immersed. Many people use salted water for soaking. Try fruit juice or wine for an extra-zesty flavor. 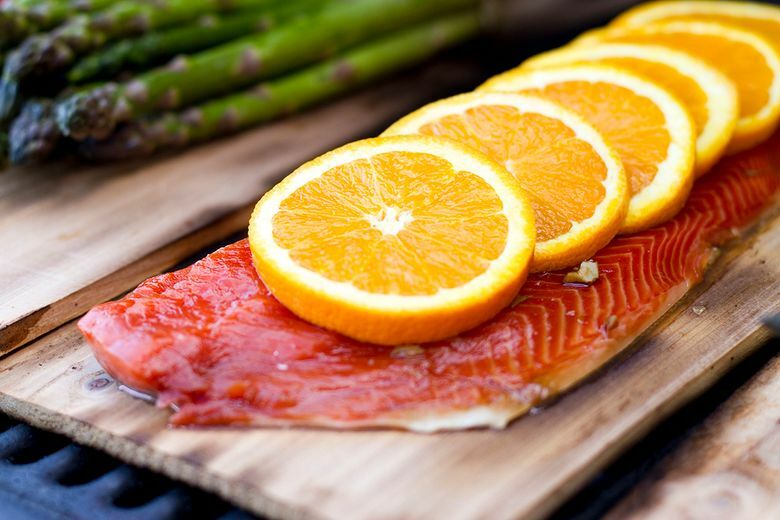 Brush the presoaked plank as well as the fish and other food with oil right before grilling to avoid sticking. Cure a new cedar plank by placing it on the grill, closing the lid, and heating for two minutes on each side. This enhances the flavor and helps avoid warping. If you’re using a charcoal grill, place the plank over ash-coated coals. For a gas grill, preheat to high and then turn down to medium for cooking. Wood conducts heat more slowly than your metal grill, so plank-cooked foods will need to cook a bit longer than other grilled foods. Remember, salmon and other fish will continue to cook after removal from the heat. After removing the grilled food, scrape the plank clean and the soak it in a container of warm water without soap. Planks may be reused two or three times, even if charred. If the wood is completely blistered, break it up and use it as smoking chips. Issaquah Cedar and Lumber has been in business for over 115 years. Specializing in more than Western red cedar, we supply the Puget Sound area with the highest-quality lumber products including siding, fencing, decking, timbers and custom-milled materials.